Without proper water-proofing, your basement and crawl space can flood during periods of heavy rain or snowmelt. Once runoff finds a weakness in your foundation to get inside your basement, it can cause the wooden elements of your home’s structure, making them warp and rot. This is vitally critical in the case of support beams and floor joists which support the mass of your house. Decayed supports and joists greatly lower your home’s structural stability and overall property value. Additionally, a water-logged crawl space is a suitable habitat for unhealthy mold and mildew which thrive in damp, dark environments. This dangerous fungus is widely known to cause several medical issues including respiratory problems, flu-like symptoms, and skin rashes. Rotten wood structural elements combined with moisture and humidity also creates the perfect habitat for unwanted pests such as rats, termites, and roaches. 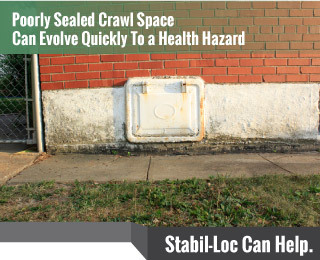 If your water issues occur when there is heavy rain, your local Stabil-Loc authorized professionals can install a reliable drain tile system. Our drain tile system consists of a perforated pipe which is laid into a gravel-filled cavity dung along the outside of your foundation. Whenever precipitation from the soil seeps into the gravel area, it into the pipe. Once inside the pipe, it will be diverted into a sump pump which will pump the water away from the homes foundation to a safe distance away . To help prevent mold growth and musty odors, we can easily control moisture levels in your basement or crawl space with a dehumidifier system. A water-free crawl space is a healthy crawl space. A significant portion of your home’s value is related to the stability and integrity of your home’s foundation. You can protect and, in most all cases, increase the value of your home with a strong, stable and secure foundation. Our friendly and helpful team of Authorized Stabil-Loc Foundation experts can help you reduce the stress and anxiety of foundation problems beneath your home with prompt, professional estimates and guaranteed repair services.